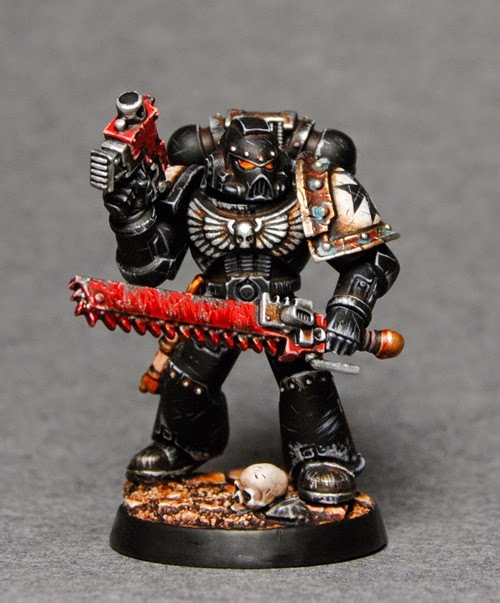 I first saw this mini on the Games Workshop flicker feed and it immediately stood out to me. It's so clean and vibrant, despite all of the weathering and blood. To me it feels like a 'Eavy Metal style mini taken to the next level. It sits somewhere between their style and what's more popular on the web right now. 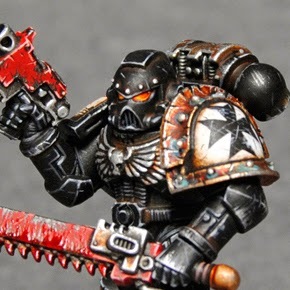 I really like the warm tones he used on the white shoulder pads, it brings some nice contrast to the black. The chainsword and bolt pistol act as nice spot colors along with the eyes, although I do feel like maybe the blood on the sword has been overdone a little bit. I'm just a huge sucker for the 'Eavy Metal style. It might not be as technically advanced as some of the more muted, "realistic" styles out there, but it just looks great. It's always nice seeing someone emulate that style and put their own spin on it. The weathering is top notch, especially the micro scratches. It seems simple but it's actually pretty hard to do. It's not very easy making something look random and natural. The one part of the model that I feel is lacking is the chest eagle/skull. It just doesn't match the rest of the quality. It doesn't distract the eye too much though and overall I still really like this Black Templar. For the Emperor! Don't forget that there is now a dedicated section on the Mengel Miniatures Forum for the Mini of the Week where you can discuss the latest model or suggest one of your own. There is an event coming up sometime soon that any painter will be highly interested in with opportunities for awesome prizes and other cool rewards. You'll have to be a member of the forum to participate though. It's free to sign up and only take a few seconds, so why not join today?